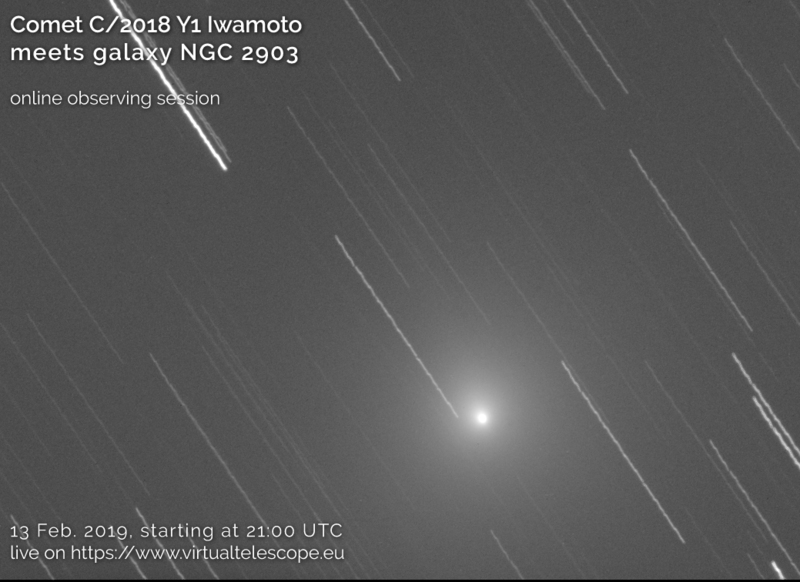 Next 13 Feb., comet C/2018 Y1 Iwamoto will apparently meet in the sky with the stunning spiral galaxy NGC 2903. Of course, it will be a mere question of perspective, but the sight will be amazing. This is why the Virtual Telescope will bring this amazing event to you, online. Seeing a bright comet “close” to one of the most beautiful deep sky objects, as the spiral galaxy NGC 2903, is not happening so often. This is why we want to make possible for you to see this in real time, from the comfort of your desktop or living room. We will track this icy world while it will move across the stars, having its appulse with NGC 2903, a wonderful spiral galaxy in the constellation of Leo (the Lion), placed at about 30 millions of light year! A mind-blowing experience. The online, free session is scheduled for 13 Feb. 2019, starting at 21:00 UT.